From unremarkable beginnings as a development of the Empire Star for the 1938 sales season, the BSA Gold Star went on to become motorcycling legend. It’s one of the most evocative model names in motorcycling – and it endured for a quarter of a century, its production run punctuated by the maelstrom of WWII and brought to an end by advancing technology and production engineering techniques rather than lack of demand for the product. 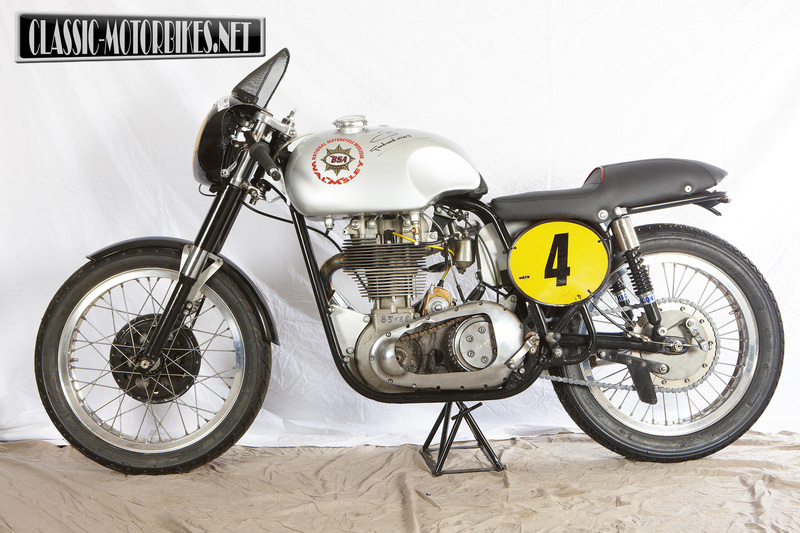 BSA’s Gold Star is possibly the pinnacle of the traditional British sporting single’s development. And it’s one of the most versatile machines to emerge from an industry well known for extracting the most out of all its designs. In competition, BSA Gold Stars have won on the Isle of Man, short circuits, scrambles tracks, trials sections – and the International Six Days Trial (ISDT). And it’s been a road burner par excellence – the darling of the café racer set from the early 50s to the mid-60s. In short, the Gold Star is the consummate all-rounder. Despite all its competition success though, the Gold Star really came about as a result of the BSA factory’s reluctance to commit to the harsh spotlight of road racing. After all 14 BSA works machines shipped to the Island for the 1921 TT failed to produce a result, the factory withdrew all backing for tarmac racing and threw its resources into trials and six-day events. But one quiet Wednesday at Brooklands in 1937 saw the exception to their self-imposed exile create a legend. The signs were there for any who cared to read them. 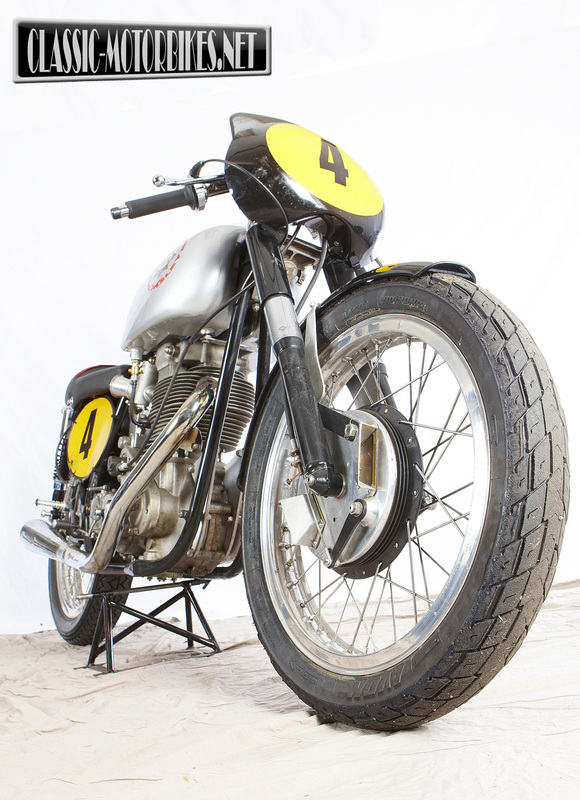 Four times TT winner Wal Handley, out of retirement thanks to the entreaties of BSA’s Bert Perrigo, was entered on what looked like a pretty standard Empire Star model. In fact, it was a highly tuned factory special, running on alcohol and with 13:1 compression and a racing magneto. In his first race out of retirement, Handley blasted his machine round the banking to collect the race win (despite a hefty handicap of nine seconds), at an average speed of 102.27mph and a fastest lap of 107.57mph. At the same time he claimed a Brooklands Gold Star (a badge awarded to anyone who completed a lap of Brooklands at over 100mph during the course of a race) and generated a huge amount of publicity for BSA. Factory bosses weren’t slow to cash in on Handley’s winning comeback. The following year, the M24 Gold Star appeared in the model line up. A star was born. Based on the Empire Star, the new model benefited from an alloy head and barrel, an Amal TT carburettor, a lightweight Elektron gearbox shell and a 7.8:1 compression ratio. With each machine being carefully assembled and tested at the factory, a power output of 28bhp at 5250rpm was guaranteed A competition (trials) version was also offered alongside a track racing version (though it remains unclear as to whether any of these were actually produced) tuned to run on alcohol fuel and give up to 36bhp. Already the Gold Star was beginning to show its versatility. Despite modest sales, the Gold Star remained in the BSA range for the following year – 1939. But other events that year would overshadow the impact of the Gold Star in any event. The war effort took priority at BSA and it would be nine long years before the Gold Star made its reappearance. With the 350 Gold Star proving a success in its first (post-war) year, it made sense for BSA to offer a 500cc version. So, for 1950, the ZB34 Gold Star joined its little brother in the catalogue. The engine was based on the existing B33 design (though with alloy head and barrel like the 350) but both the new 500 and the 350 benefited from a 8in front brake with a finned, cast iron drum and pressed steel hub. The final incarnation of the Goldie emerged for 1956, when the iconic DBD model took its bow. Produced only in 500cc form and equipped with a 1½in Amal GP carburettor, megaphone silencers and the final 190mm front brake offered as an option, the Gold Star was as near perfection as it was going to get. And 1956 also saw the introduction of the RRT2 gearbox. The adoption of needle rollers on the sleeve gear gave rise to the extra ‘2’ in the gearbox code. 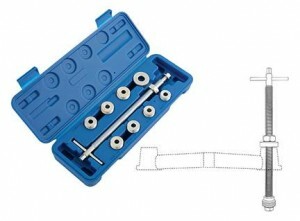 The ‘T’ refers to the layshaft needle roller bearings and ‘RR’ is the designation for extra close ratios. But all that development became part of the problem for the Gold Star’s future. By now, performance of the 500 version was up to 110mph and 42bhp. And that was a fine set of figures for any bike in 1956 – let alone a ‘simple’ push rod single. The trouble was, there was nowhere for the Gold Star to go. Although it remained in the BSA line up until 1963, the Gold Star had reached its peak in 1956. The DBD34 – seen by many as the definitive Gold Star – is the most desirable model and, consequently the most expensive. But it still delivers the real, raw essence of sporting single cylinder motorcycling with panache and a remarkable level of reliability, allied to relative ease of maintenance. And out on the open road, there’s little to beat the thrill of piloting a well-sorted Gold Star – especially when it’s a DBD34 with the RRT2 close ratio gearbox. It’s one of lifes finest experiences to be able to wind open a 500 Goldie and snick through the ratios imagining yourself in the Clubmans TT back in the 50s. The big 190mm drum at the front (if fitted) will swiftly haul you back into reality if the occasion demands and the sure-footed handling of the excellent BSA duplex frame allows you to exploit the full potential of the 42bhp on tap. Single cylinder motorcycling doesn’t get much better. 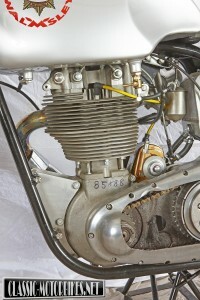 1938: Girder forked and rigid framed 496cc M24 model becomes the first BSA to bear the Gold Star name. Based on the established M23 Empire Star model, it sports alloy head and barrels with the push rod tunnel integral with the cylinder casting. 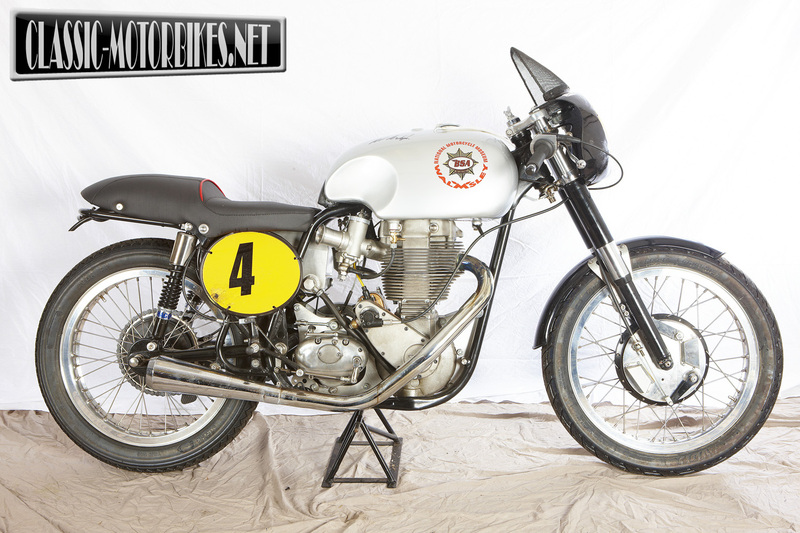 An Amal TT carburettor and 7.8:1 compression are enough to give the first generation Goldie a power output of 28bhp at 5250rpm. Chrome plated tank with silver painted panels bears the ‘Gold Star’ badge in honour of Wal Handley’s exploits on the tuned Empire Star at Brooklands the previous year. 1939: Revised timing gear, larger oil tank, a valanced rear mudguard and instruments mounted in the top of the tank are the main changes to the Gold Star in its second year of production. Colours as for 1938. Production of all civilian machines is halted by the outbreak of war. 1948: The new Gold Star is shown at the Earls Court Show. 1949: Based on the B31 (introduced in 1945) the first post-war Goldie goes on sale. It is an all alloy, 348cc machine typed the ZB32 – again with integrally cast push rod tunnel – with telescopic forks, a 7in front brake and either rigid or plunger rear end. Colours: black with chrome plated tank with matt silver panels lined in maroon and bearing the Gold Star badge. 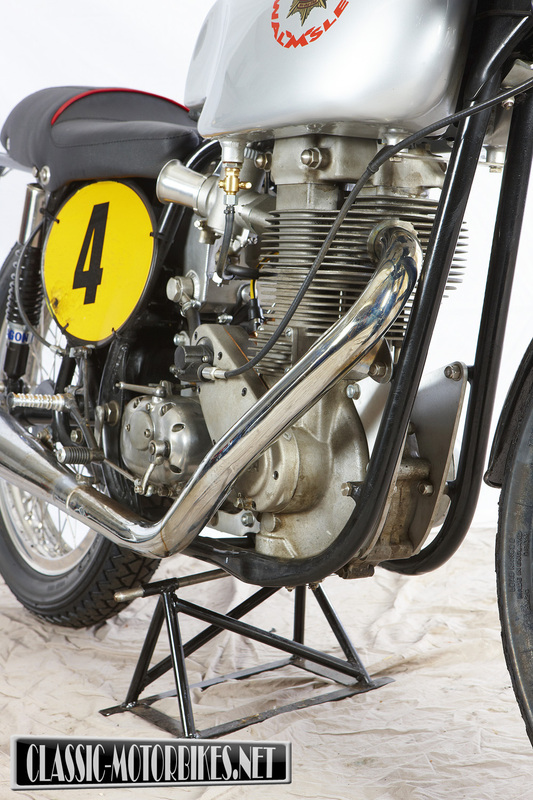 1950: A 499cc Gold Star – the ZB34 – joins the 350 in the range. Both are fitted with a new 8in front brake. 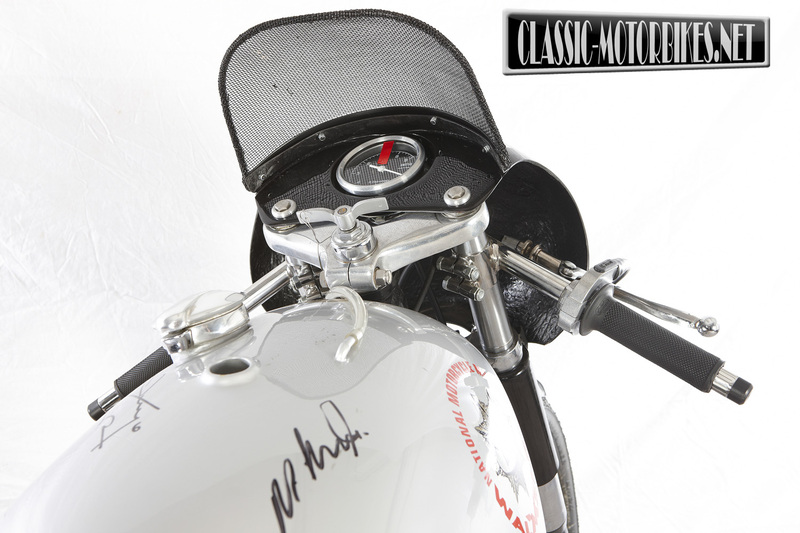 1951: Late in the year, a die cast head (with separate rocker box) and barrel are adopted for the 500cc model. 1952: ZB32 models get the die-cast head, together with a shorter connecting rod and barrel (with one less fin). . Fuel tank now matt silver with maroon lining. 1953: The BB series model appears – though still with the small fin barrel. Swinging arm frame (from frame number BB32A-on) offered alongside rigid and plunger options. Fuel tank matt silver with chrome plated panels lined in maroon. Colour scheme remains essentially unchanged throughout the rest of the Gold Star’s production life. 1954: The BB series continues, but big-fin CB type engine appears. The new engine features a short con-rod, oval flywheels (on the 500 versions anyway) an Amal GP carburettor, needle roller bearings on the gearbox layshaft and five through-bolt fixing for the cylinder head as well as a swept back exhaust. 1955: BB and CB models continue alongside new DB version of the Gold Star. The new model has four bolt head mounting, thicker cylinder liner, smaller flywheels, clip-on handlebars, vented brakes and a speedo and rev counter as standard. 1956: The 350 Goldie is offered in DB guise only and the final DBD version of the 500 Gold Star appears. 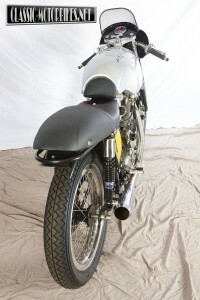 It has 1½in Amal GP carburettor, megaphone silencer and optional 190mm brake and 5 gallon tank. 1957: DB and DBD models continue. Available in Clubmans, Racing or Scrambles trim. 1958: All 350 models dropped. Only the DBD500 is available in either Scrambles or Clubmans specification. 1959: 350 engine offered as an option (though in 500 running gear). 1960: Clubmans model continues unchanged. 1962: 350 option deleted from the range later in the year. 1963: Final year of production for the Gold Star.